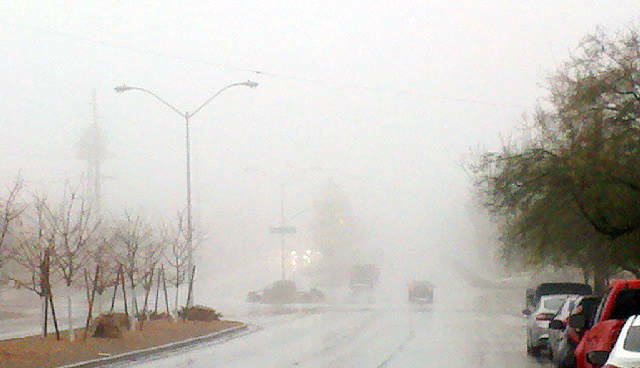 Paul Luisi Fog and low clouds on Tuesday limited visibility along Adams Boulevard, near Buchanan Boulevard and the Boulder City Hospital. As of noon Tuesday, the National Weather Service reported than nearly 1 inch of rain fell on parts of Boulder City. Fog and low clouds limited visibility Tuesday along Adams Boulevard, near Buchanan Boulevard and Boulder City Hospital. As of Wednesday morning, the National Weather Service reported than nearly 2 inches of rain fell on parts of Boulder City.